Skyfall was one of my favourite movies of last year. It had fun action sequences, an awesome villain and a great story. Plus I just love Daniel Craig as Bond. 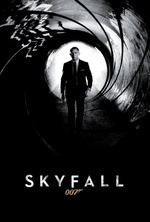 I wouldn’t be surprised if Skyfall wins Outstanding British Film at the BAFTAs. I’m also rooting for it to win Best Cinematography at the Oscars, cause I loved how it was shot. if you could create your own movie, what would it be about? Be creative, be original, be fun! The winner with the “best” answer will win one of the two copies. The other one will be drawn at random. You’ll also get a second entry if you’re following me on Twitter and tweet about this giveaway with the hashtag #missgeeky. The competition is only open for UK residents and will end on Friday 15th 15:00.